Pardner, Hold on to Yer Hat! This 5+ mile hike offers a variety of terrain, frequently changing vegetation, and a view of the salt basins that are southwest of the park. The hike uses both the Salt Basin Overlook trail and the El Capitan Trail. Note that a significant portion of the hike is on very high, steep hillsides that leave little room for missteps. 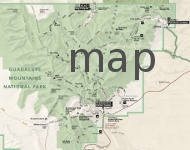 The trailhead is found off an old, abandoned road of Guadalupe Mountains National Park. 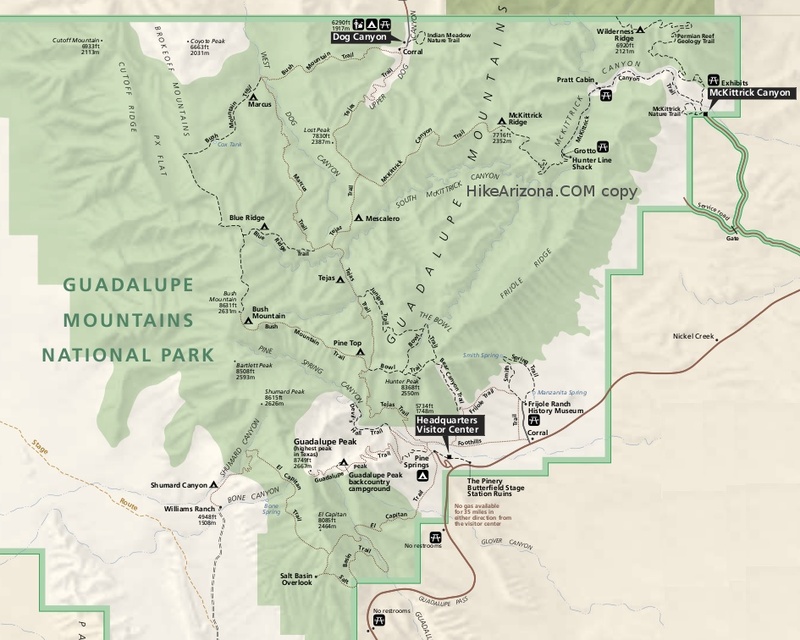 After leaving your vehicle and passing through a hiker's maze, walk west up the road to a second hiker's maze that is signed "Guadalupe Canyon". You'll shortly see on your left a brown sign indicating the trailhead. We chose to hike in a clock-wise direction as a ranger told us that the last part of the loop can be confusing if you go in the other direction (and we didn't have the hike on our gps device). Not long after leaving the trailhead you'll drop down into the wash that was on your left while you were walking up the old road. Hike across the wash and you'll come to a "T". Actually, you might not even notice the "T" if, like us, you knew you'd be going clockwise and headed to the left once out of the wash. If you take a right at this "T" you'll be going counter-clockwise. From here you'll see three hitching rails and, ever-looming above you, the El Capitan formation that flanks the southern end of the park. The trail is easy to follow up and around hillsides, across drainages, and through flat prairie-like areas. There are noticeable elevation gains and losses, but nothing that a brief rest can't conquer. At times you'll be in a sea of golden grasses, then short junipers, changing to sage, then yuccas, and back to grass. You won't get visually bored. You'll notice numerous cairns along the way, some as tall as mid-thigh, that seem to have no reason or meaning as the trail is very obvious. After rounding a very pointed hill on the southerneastern-most part of the hike, you'll begin the climb towards the overlook. Pay attention for a very large cairn that indicates the offshoot to the overlook. Taking the left path at this "Y" leads you down to a flat area with a second set of three hitching rails. Just past (west) of the rails is the edge of the overlook. It's a nice place to stop for lunch or a snack. Upon returning to the "Y", you'll take a sharp left and traverse a very steep slope in a north-westerly direction to the junction with the El Capitan trail. It was very windy the day we were out (as it often is in west Texas) and we had to hold tightly on to our hats. There would be no retrieving a hat blown off by gusts as this part of the trail is especially narrow and any missteps could easily result in a long, bone-breaking tumble down the mountainside. Be careful! A sign at the junction indicates that you're now on the El Capitan trail. Taking a left would lead you around the west side of El Capitan to Shumard Canyon. This hike, though, follows El Capitan trail to the right, along the southeast base of El Cap. As before, the trail is easy to follow, but becomes increasingly rockier and rougher as you descend. Eventually you'll come to an overgrown, tree-lined ravine (Guadalupe Canyon) and the third set of three hitching rails. As soon as you see the rails, take a right (the rails will be between you and the bottom of the ravine). You're now back on the Salt Basin Overlook trail, headed east towards your vehicle. The trail is no longer as obvious as it crosses back and forth and down the drainage so watch for the cairns. At one point you'll be walking down the wash and come to a very large tree. Move to the right of the tree and up out of the wash. From there it's a short hike to the original "T" and you'll be back to the hiker's mazes within minutes. From El Paso, TX, take the 375 bypass to US-180 East/US-62 East. Stay on US-180/US-62 for 91 miles. There is a small parking area on the left across the highway from a larger parking area. If you miss the turnoff you'll come to the main entrance to the park in a few minutes. Turn around and set your odometer to zero and drive a little less than three miles to the parking area on your right.